Seven Flaws in Mike Howards’ "Children of Cain"
To define traditional witchcraft, a term Robert Cochrane coined, is not an easy task – and making a historical study of its key personage is quite hopeless unless you have access to the total array of the many legacies intended to be studied. Traditional Witchcraft is always followed by an unwritten history – its shadow where truth lies and blossom only amongst those sworn to protect the truth and its light. This factor alone makes the kind of historical account Howard attempts to present here impossible – at best biased and distorted. In ‘The Children of Cain’, recently published by Three Hands Press Michael Howard has proposed the impossible and is of course failing dramatically in his project. After reading the book I am seriously questioning if this work is the product of an unsubtle agenda – hence his mediocre history is a deliberate attempt to present an alternative to truth – or if it is just a testament of the impossibility of the task he assumed in writing a book upon such vital premises as this. This taken into account, Howard is deliberately inviting problems by writing with authority about The Clan of Tubal Cain, a living tradition he is not a part of, nor has focused upon as essential source of information. Rather he has decided to recreate The Clan of Tubal Cain from within the Craft sodality he himself makes part of, Cultus Sabbati. 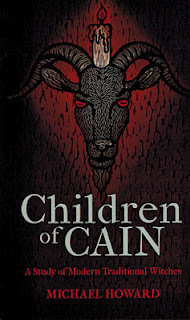 There is nothing wrong as such in doing this – but given the fact that ‘Children of Cain’ pretends to be a historical study the premise of the book misleads the reader. The subjective view upon historical facts is the eternal challenge for the historian and the critical academic researcher, because we are always lodged within our own world in relation to what we are studying. I will only remind of Ricoeur and his wise counsel about the possibility for distortions of our presentations that occurs in our dialectic of interpretation of historical facts. This because as Derrida said, facts never speak for themselves – we always give them a voice. From this more critical perspective upon his scholarship I find his work with source material questionable, at least ‘eclectic’ as he constantly strives to give an image of Robert Cochrane as a dysfunctional madman. This is quite typical for poor scholarship or manipulation of data. Certainly Cochrane was complex and complicated – but this fiery and angry part of Cochrane is given over to obsessive interest from Howard. In this selective work with his data I also find it quite puzzling that he is using a distant nephew of Cochrane as a key informant. Wouldn’t it have been logical to resort to those upholding his spiritual legacy and those in his family that actually had and do still retain any interest in his work? Of course a nephew can shed light upon his uncle – but it is still solely one perspective coloured by the relationship – or lack of relationship – they had. It is also interesting to take note in how he presents Andrew Chumbley from Robert Cochrane. Chumbley is given a hagiography, following a devotional reverence as in the biography June Jones wrote about Alex Sanders. As a personal friend of Chumbley I do understand why Howard praises him to such extent – but still the contrast between this saintly tale and the pulp fiction he builds around Cochrane – which is quite tough in its beatnik way I must admit - is striking in contrast. So, from these initial concerns I naturally also question inaccuracies in his book that perpetuate the suggestion of an unsubtle agenda behind various errors such as the dating of a photo of Evan John Jones (image 8) to 1999 while it is from 2003, or if it is just typifies a general lack of care with his data. As a sworn brother of The Clan of Tubal Cain, having access to all data denied for Howard, I may take the liberty of addressing issues found at the tip of the iceberg that gives cause for concern of this books reliability. 1. With Cochrane's death The Clan of Tubal Cain ceased to exist. On page 30 Howard states that The Clan of Tubal Cain ceased to exist with Cochrane’s passing and that Evan John Jones revived CTC ‘several years later’. This is simply not true. The work continued and Jane Bowers, Cochrane’s wife, passed the Magistral office to Evan John Jones soon after Cochrane’s passing. Hence the work continued, but away from the public eye – as expected given the circumstances. 3. CTC, The Regency and The Royal Windsor Coven are basically the same, one can explain the other. The assumption that CTC worship a deity named Goda is followed by assumption on page 81 that seems to take matters pertaining to The Regency, the (alleged name) Royal Windsor Coven and Doreen Valiente’s opinions as directive for The Clan of Tubal Cain. In fact Howard is confusing these planes constantly adhering to whatever fits his hypothesis. Howard is here assuming that CTC adopted several guises for the God and Goddess, like Baal, Wayland, Bran and so forth – developing and asserting a very Wiccan format of working that is nothing more than an error, a figment of imagination, true only in Howard’s mind, while for Evan John Jones it was used as analogy, a method to make salient a given principle at work. Again, we find here a matter understandable for those who make part of Cochrane’s legacy but apparently blinds those who is barred from it. If Howard had been privy to the teachings of The Clan of Tubal Cain he would have realized that CTC do not work with a set ‘pantheon of deities’ as he suggests – and in particular his perspective of the triple goddess that he constantly seeks to impose on CTC. Cochrane and then Jones – as CTC still do – have always affirmed that the pale faced goddess is truth and Creatrix; so per se, CTC do not revere a ‘witch goddess’ as such. On page 71 and 72 we find so many inconsistencies that I would dare say we are here speaking of twisting facts so much that we are entering the domains of vivid and sensationalist imagination or shameless lies. It is also an excellent example of how Howard is abusing his data and rewrites context so it can support the idea he has shaped in a remarkably biased way. One problematic issue here is Howards’ assumption that the virtue was lost, while even Valiente states that the virtue remained with Jane and was hers to pass on. It was not lost as Howard likes to think. In general the chapter is riddled with comments that ascribe great worth to Valiente albeit only when she is supporting Howards view and quickly discarded when she opposes his view. Howard insinuates that cursing was a common occurrence during several of the Cuveen meetings. In fact only once did a heavy cursing take place – and it is this single severe case mentioned in his book. Also in the same pages Howard insinuates that Cochrane was quite a drug fiend – while in truth his use was sporadic and was probably not more dramatic than was common in the counter culture of the 60’s in general. But I must add that indeed he held mastery of poisons and the Green Witchdom, but for Howard this is minor and insignificant as he presents Robert Cochrane the man, the witch (a title Cochrane abhorred) as a dysfunctional lunatic. Of course he had some powers – but as his distant nephew told Howard, this was just a lie. Howard has for a long time had a near obsession (as I perceive it) with the ‘Luciferian Tradition’. It might seem like semantics of where and how we shall cut the hair – but the implications are profound. In this subject alone Howard contradicts himself throughout the text. For instance on page 81 he states that in his opinion Roy was in touch with Luciferian witchcraft, he even states that the Magister in Cochrane’s Cuveen was considered a representative of Lucifer – but in the chapter itself he doubts this succession because John denied such connection for him. Can it be that John deliberately mislead Mike? Because in a past not that distant it was to invite problems to state such allegiance, this is easily testified to be the case until a decade ago in UK with the tension in the population concerning witchcraft and Satanism linked to child abuse. So, considering these circumstances, how expensive is not the trust given to those we speak with outside of the circle of sworn brothers and sisters. Howard also states that he coined the term in the 1990s, as this will give him some automatic right to judge who is and who is not ‘luciferian’ - but in truth it was Paul Huson who made the connection between Lucifer and witchcraft in the introductory chapter in his book Mastering Witchcraft from 1970. Huson’s book had a profound impact in Italy and the term ‘Luciferian Witchcraft’ was in use there already in the early 70’s. Considering that any critical study of historical events should strive to present a landscape as wide as possible - Howard’s presentation of The Clan of Tubal Cain does not fulfill this obligation and duty to the fact. It does give the impression that Howards’ aim with this book is to present his own tradition, Cultus Sabbati as superior somehow – while I think any mature and well intended study would seek to disclose sympathy and harmony in the Craft and not manipulate the reader into assuming there is a hierarchy at play here in terms of who is better. In this regard I find reason to question if the way Howard crafts ‘The Children of Cain’ is simply a product of failure to observe the rules for good scholarship or if he has some sort of malicious agenda behind his presentation of The Clan of Tubal Cain. He is far too fond of making conclusions for the reader, insinuating that the reader should or could not make up his or her own mind. In all fairness I must add that Howard demonstrates in the chapter about the Horseman’s word (chapter 5) a capacity for objective historicity – but in the chapter about Cochrane he is also demonstrating a gift for fiction. So this leads me to question the motives of such unnecessary actions in his discourse of CTC – because in the end of the day his fictional history of CTC ends up being nothing else than ‘His Story’. Howard has been involved in the study of traditional witchcraft for more than 40 years and has showed a surprising dedication and stamina in his work as the editor of The Cauldron. Given his amount of knowledge and experience I am actually surprised about the tunnel vision he presents in this work. So in spite of his 40 years dedicated to the Craft I must question if not some of us have been more fortunate….